In the field of M. tuberculosis, PCR-based RFLP is not so widely applied as the classical RFLP method. In a novel application of locus-specific RFLP, Cockerill et al. have identified point mutations in the katG gene of M. tuberculosis that correspond to different levels of resistance to isoniazid by comparing the different RFLP banding pattern produced by the amplified gene. However, the discriminatory power is limited compared to other methods. M. ulcerans and M. marinum are slow-growing mycobacterial species with optimal growth temperatures of 30°C to 33°C. These organisms are emerging nec-rotizing mycobacterial pathogens that reside in common reservoirs of infection and exhibit striking pathophysiological similarities. The interspecific taxonomic relationship between the two species is not clear as a result of the very high phylogenetic relatedness. To help understand the genotypic affiliation between these two closely related species, another approach of RFLP has been performed; namely, PCR restriction profile analysis (PRPA). By targeting the 3' end of 16S rRNA gene and by using three restriction enzymes, a set of geographically diverse M. ulcerans and M. marinum have been investigated.1-19-1 The results (Fig. 3) showed that M. ulcerans can be typed at both intra- (three subtypes related to the geographical origin) and interspecific levels (differentiation between M. marinum and M. ulcerans). However, the major limitation of the technique is related to its discriminatory power as it cannot usually differentiate between these two species (Fig. 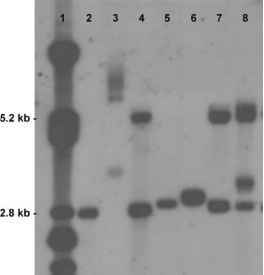 3); this may be related to the high degree of conservation of the mycobacterial 16SrRNA genes.